Buckeye Butterflies (Junonia coenia) are easy to recognize because of the large eyespots on their wings. 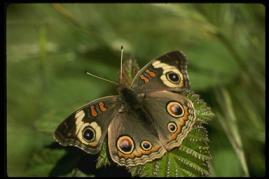 Like most butterflies, buckeyes have evolved to evade predators and the eyespots scare away most would-be predators. Buckeyes are medium sized butterflies with a wingspan of approximately 2-2.5 inches (5-6.3 cm). 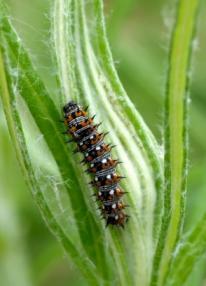 They belong to the family Nymphalidae, along with the other brush-footed butterflies. Buckeyes are found throughout the United States and Canada. In the fall buckeye butterflies move South because they aren't able to overwinter in the northern parts of North America. However, they don't exhibit the true migration of monarch butterflies. Adult buckeyes feed on flower nectar. Their favorites are butterflybush flowers (Buddleia davidii), goldenrods, zinnia, and Verbenas, however, they will feed on the nectar of many different flowers. The chrysalis is mottled brown and white. Buckeyes generally produce about two to four broods per season. Copyright © 2008-2018 ButterfliesSite.com. All rights reserved. Images from istockphoto.com and the Corel Corporation - and may not be copied.